Dejected Derry players leave the Brewster Park pitch after learning of Down's draw in Cork. Derry assistant manager Brian McGuckin admitted "league tables don't lie" but backed the character of the Oak Leaf players to bounce back from the disappointment of relegation to Division Three. McGuckin said the Derry players and management team had gone through the full range of emotions after Carlus McWilliams' glorious point almost five minutes into injury time looked to have sealed their place in Division Two. Down were trailing to Cork at that point but within seconds of the final whistle, news began to filter through that a late Jerome Johnston free had salvaged a draw for the Mourne men and thus condemned both Derry and Fermanagh to the third tier for 2018. "It is hugely disappointing but league tables don't lie," admitted McGuckin, "We are in Division Three and that is the reality of it all. It is what it is. We'll started in Division Three next year and obviously try to get out of it very quickly. "It was elation to devastation. There were periods in the second half when we were not clicking at all and it wasn't looking good. We had a big final push there in the last 10 minutes and got ourselves into a great position. We kicked a wonder score to win the game and, yes, we thought we had done enough but then the news came through that Down had got a draw in Cork. It is hugely disappointing. "It was made very clear to everybody that we can only do what was within our control. We weren't putting any focus on that other game. we were going out to do our job and then hoping obviously that Cork could do theirs but it hasn't worked out that way." Derry finished as one of three teams on five points which meant the final positions came down to scoring difference which left Derry, on a difference of -34, well adrift of both Down (-18) and Clare (-12). "It was an extremely inconsistent campaign," added McGuckin, "There were positives but there were games when we simply didn't perform anywhere near our potential. You can make excuses and talk about giving young players game time - and that has worked in our favour - but it is a results business and unfortunately we have come out on the wrong end of those games. "With regard to today's game, we have been in that position before in previous games and lost those games so we will take a lot of heart from the result today. "We showed the necessary character, we just have to become more consistent. We proved in the final fives minutes with those last couple of scores what we are capable of. We have to look at the positives and try to build on them. Try to do them more frequent." 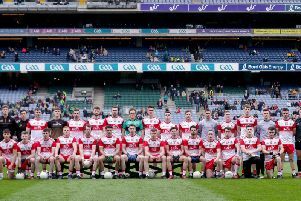 Derry now face the ominous task of lifting themselves for an Ulster Championship tie with Tyrone but McGuckin doesn't think that will be a problem. "The league is over. It was a competition and that competition is now over. We finished on a positive (with the win) and it was important that we got the result today with the build up to our Championship game. "I don't think there are going to be any issues with building these players up for the Tyrone game. Obviously we will release them back to their clubs this week but then we will get refocused for Tyrone in seven weeks time."